I took a share taxi ($10 for the front seat) from Kompong Thom to Phnom Penh and had a shock upon entering the city. For a little background, I took some photos for the inaugural issue of 7 Days, which is a weekly lifestyle magazine put out by the Phnom Penh Post. One of the photos, which is has Sapor Model Nai holding a Cosmopolitan ran as the cover. 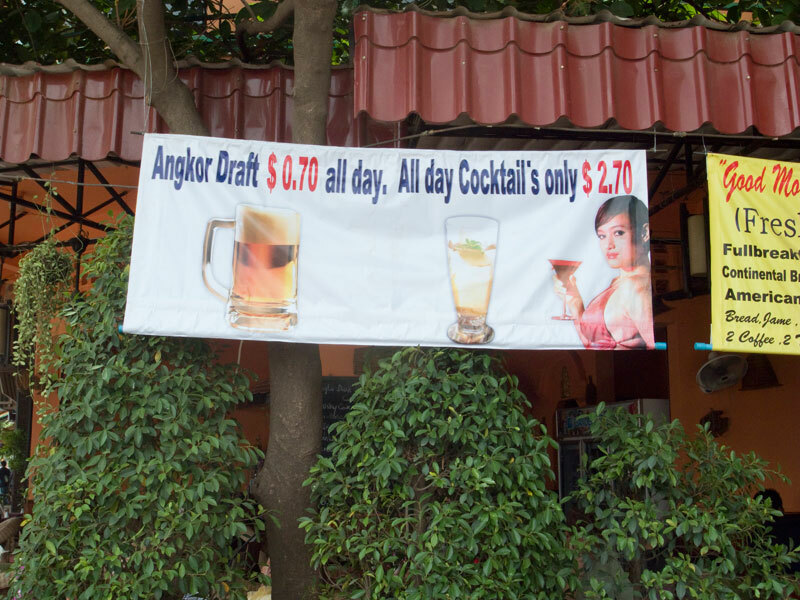 So imagine my shock when I discovered that the same picture was plastered on a banner on the riverside advertising cheap cocktails at a restaurant. The problem is that copyright laws in this country are non-existent and it looks like there is no legal recourse I can take about this. Will have to think about it. This entry was posted in Uncategorized and tagged Cambodia, fashion, model, Phnom Penh, Phnom Penh Post, photographer, photography, plagarism. Aw, I’m sorry about that. I am impressed how quickly they ripped off your image though. Or is it the highest of compliments for your photojournalistic skills? At least you can drive by and tell everyone….I took that photo.